Central to the program is the single or dual-pane file manager which allows files to be opened with a single click. The file manager has all the normal file management functions but also includes such useful features as path copying and bookmarking and easy nested folder creation. The built-in text editor features a spell checker with live spelling, a thesaurus, line numbering and syntax highlighting for a number of popular programming languages. HTML files can be viewed as code or with the built in browser. The image viewer, also coupled to the file manager, is designed to allow numerous image formats to be easily viewed. Filedoyen comes with a powerful archive or zip manager which can work with most compression formats including ZIP, RAR and CAB. As the archive manager is coupled to the file manager, a single click on an archive will open it. A unique feature of Filedoyen is that a file within the archive can, with a click of the mouse, be previewed in the editor or viewer. The hex editor can be coupled to the file manager and enables one to see or edit the raw and exact contents of a file. The search tool can search for files in large groups of compressed archives or for files and test within files anywhere on a drive. 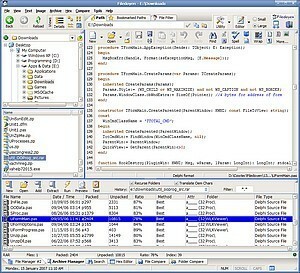 Filedoyen's file compare utility enables text based files to be compared and differences to be highlighted. Folder compare works in a similar way but compares folders instead of files. Whether you want to just shuffle files around, decompress a Zip archive, edit a file, look at some images or Web files, compare folders or files, search for files, text or within archives or even get down and edit a file in hex, Filedoyen can do it all and more - easily.